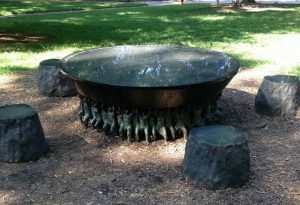 —for the Unsung Founders Memorial (UNC Chapel Hill), 2005 (black granite, bronze sculpture) by Do Ho Suh. Image made available by The Carolina Story: A Virtual Museum of University History (UNC Chapel Hill)/Virtual Black and Blue Tour. Again, Wonderful Nicole! I love the thoughtful work of this artist and you added to the conversation and feelings about such memorials.